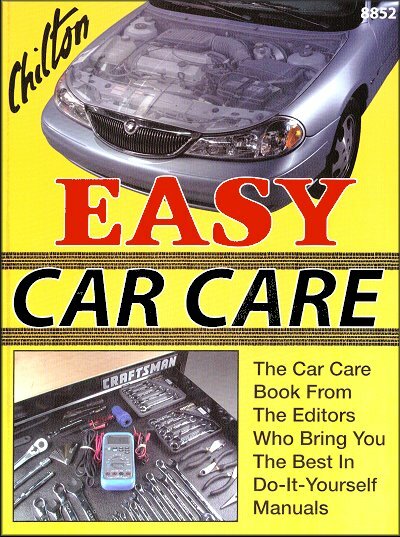 The Chilton Easy Car Care 4th Edition is the perfect basic repair manual for the home mechanic. Tune-ups, oil changes, spark plugs, rust repair, belts and hoses, and much more. Step-by-step repair and maintenance procedures are accompanied by b&w photographs and illustrations to help you along. No vehicle owner should be without the information in this manual. Small bulbs, used for most automotive applications, come in several basic types: single contact bayonet base, double contact bayonet base with opposed or staggered indexing lugs, cartridge types for a small, flat installation, and wedge-base light bulbs. Small bulbs show a broken filament when burned out and are easily replaced. Turn them about 1/4 turn and pull them from the socket. The single contact bayonet base is usually used for instrument panel lights in a small snap-in socket. The major difficulty in replacing these is finding them. The double contact bayonet base is commonly used for turn signals, parking and taillights. The staggered indexing lugs allow one-way installation so the filament connection is correct. These bulbs are reached by removing the lens or light assembly; inside the trunk is also a common place to hide the light housings. Don't forget to install the gasket under the lens or housing, if one is used. The gasket seals out moisture, a major cause of bulb troubles. While the bulb is out of the socket, check the socket for corrosion and if necessary, clean it. Poor grounding is a major cause of non-functioning bulbs, especially when the bulb filaments are OK. Scraping the terminal sockets and polishing the bulb contacts is frequently all that's required. Also, check the ground between the bulb housing and the fender, and between the fender and the body. The electricity has to get back to the ground (negative) side of the battery. If it can't because of poor grounding, the bulb won't work. Many times, running a ground wire from the bulb housing directly to the frame of the vehicle is easier than trying to make a ground through rusted sheet metal. Fuses never blow because of high voltage. High amperage in the circuit, greater than the capacity of the fuse, causes the metal strip to heat up, melt and open the circuit, preventing the flow of electricity. A fuse could carry 200 volts as well as 2 volts, but will only tolerate its rated amperage and about 10% to handle minor current surges before it blows. Auto fuses come in several designs, but all usually consist of a zinc strip or piece of wire. The old glass fuse, used in older model vehicles, is primarily used in accessory applications today. On all late model vehicles, you'll likely find a fuse that is different from the old glass tube fuse. It's a miniaturized, blade-type design that is referred to as ATC, ATM, or MAX fuse. The "blade-type" was developed in conjunction with the smaller fuse block. Fuses of different ratings are interchangeable but amperage ratings are molded in color-coded numbers that match the fuse ratings on the fuse block. The following chart identifies the amperage and color codes. What is the publishing date of this book? July 1, 1998. Thank you. Ask a question about Chilton Easy Car Care: Basic Car, Truck, SUV Repairs. Comprehensive explanation of concepts and mechanisms, with good diagrams and charts. I am a longtime, backyard mechanic who's worked on a handful of cars, going back to the 70s. I had always bought used cars and car manuals, but in the last 20 years, have not owned a car of my own. Instead, I've used bicycles, public transportation, and getting rides with friends. I purchased this book from The Motor Bookstore for a close, guy friend who's experience had been leasing cars. However, he just bought a new SUV, and his attitude towards maintenance and mechanics has completely changed. Instead of doing the minimum necessary (the barest inspection of mechanics, careless driving and handling, etc. ), he has started peppering me with lots of mechanic questions. Because I had bought this book for myself previously, and am reading and studying it out of it currently, I can vouch for the fact that this book offers plenty of helpful information about car mechanics. The explanations and diagrams are clear and straightforward, so that the reader can understand concepts, layouts and mechanisms pretty well. But for more specific information about a vehicle, it's necessary to purchase a book that's specifically focused on that make, model and year. I would highly recommend this book, either alone, or in conjunction with a model-specific manual, or service manual.